Help young or beginning players hit all their goals with this softer (and safer) soccer trainer. 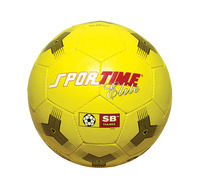 Active students will definitely get a "kick" out of the Sportime Number 7 SB-Trainer Elite Soccer Ball. With a lightweight feel (yet tough construction), this trainer is the ideal ball for teaching soccer. Ball is 33 percent lighter and 24 percent larger than a traditional size 5 soccer ball. SB-Trainer Elite is built to rigorous specs to ensure roundness and long play and is fabricated using top-quality synthetic leather that holds up indoors and out. Bright yellow soccer ball is sold individually.